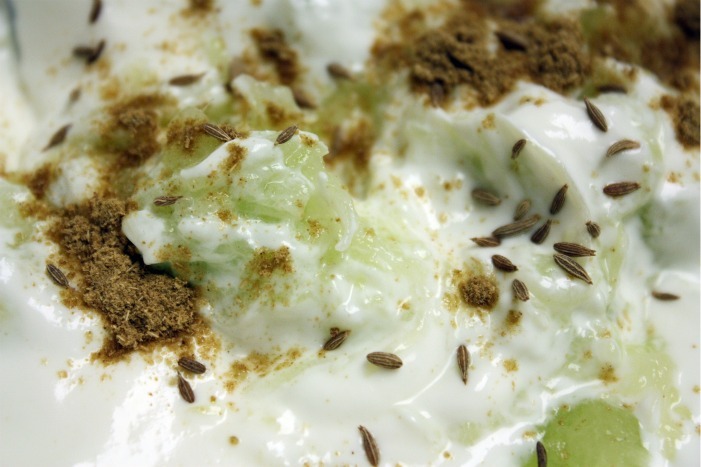 You may not automatically think of sour cream when you hear "indian food" but it's a wonderful secret ingredient that many who love indian cuisine use! 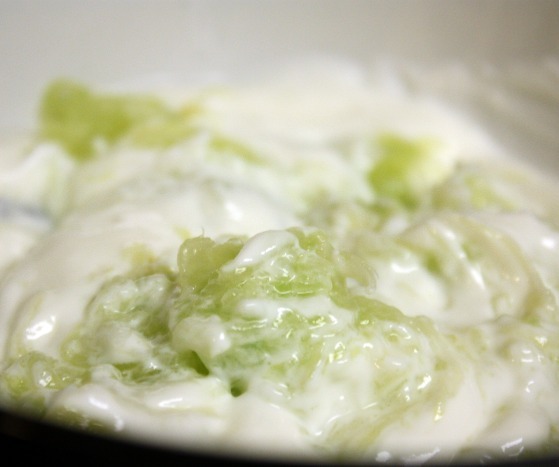 Typically its yogurt that is used for marinades and raithas but those who have tried it know that sour cream (reduced fat) makes a wonderful rich, creamy substitute. Try these two dishes and leave your guests wondering how you learned to cook so well while they ask for seconds and thirds! 1. Prepare the dee.lish. marinade. Its super simple ! - all you need are the following ingredients (to taste) and a blender! Blend together: sour cream, fresh coriander, mint, chili powder, cumin powder, turmeric, salt, paprika, coriander powder, lemon juice, onion and a little bit of water. sour cream is so yummy! 2. Cut up chicken thighs (with bone please! marrow makes this dish amazing) and rinse the chicken pieces with a mix of vinegar, water and turmeric. After rinsing the excess vinegar and turmeric off of the chicken pieces once more, add the blended marinade to the chicken pieces. 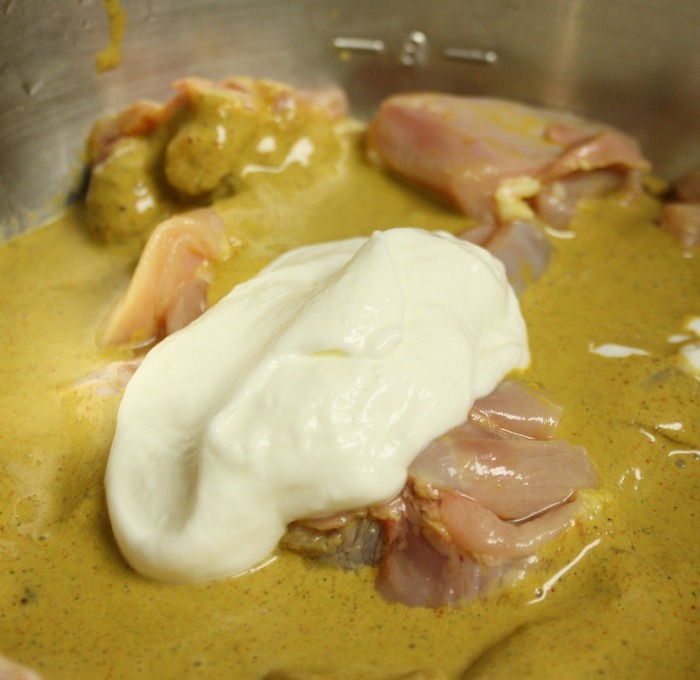 Add a bit more sour cream to make a thicker marinade if you like! : j Put the chicken in the fridge while you prepare the rest of the ingredients. cant wait til its done! 3. Get your "Mise en place" in order! Cut up onions, open a can of canned tomatoes, dice garlic, puree fresh ginger, grind the following whole spices into a powder (bay leaf, cardamom black and green, cinnamon, cloves, anise) and set each of them aside. Heat up a heavy bottomed pan (I love my dutch oven! Does some kind soul want to get me a set of Le Crueset? : j ) and add oil. Add mustard seeds to oil and once they start to pop, add the diced onions. Once they are nice and soft, add the ginger and garlic (the more the better if you ask me). Saute until all the ingredients are soft. Push the onions etc off to one side of the pot add a touch more oil and then add spices: chili powder, cumin powder, corriander powder, turmeric and paprika as well as the ground whole spices . Toast the powdered spices for a minute and then mix with the onions, etc. Add crushed tomatoes and then cook for a couple of more minutes. 4. Add the marinated chicken pieces (and a little bit of the marinade as well). Cover and cook for a good 20 -30 minutes stirring in between. Add extra water if needed. Once the chicken pieces are almost cooked, take the cover off and let the sauce reduce into a spicy flavorful gravy. 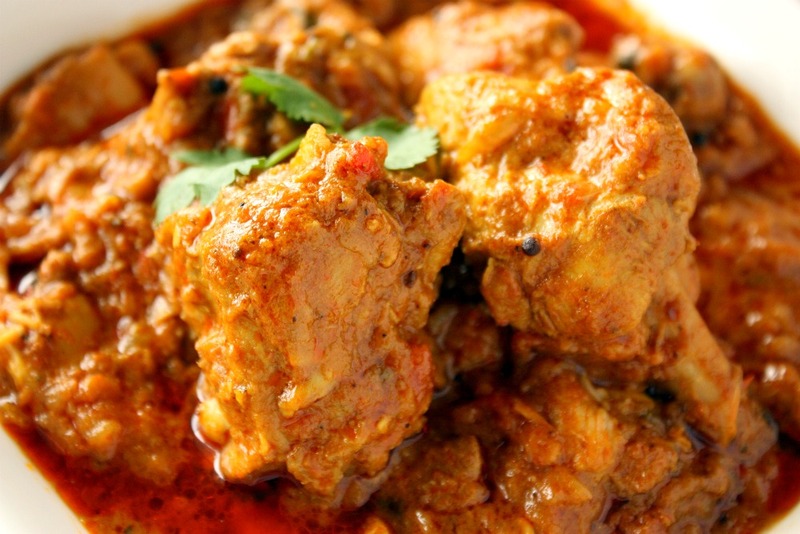 What's a better accompaniment to a spicy yummy chicken curry than a cool creamy raitha? Heres how! 2. Squeeze out the excess water. 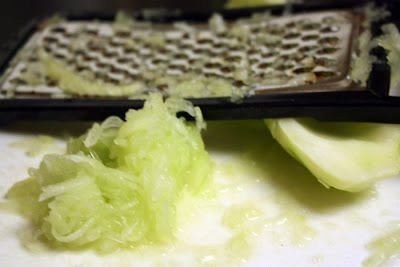 Add the shredded cucumber to sour cream. 3. Add cumin seeds, cumin powder and salt and mix. 4. 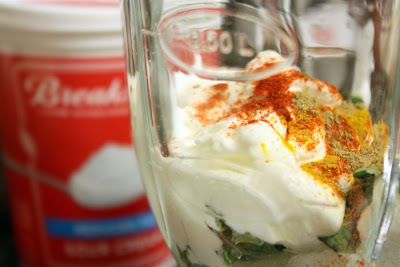 Add chopped mint, mix and serve! Wow! I love the ingredients you used for this dish! And you'd made it sounds like it's so simple to put together! Look your photos! Ohh my my..I can't come with a word..this looks amazingly delicious! Yummylicious!!! ur snaps r lovely and perfect allways both recipe is just mouthwatering. Yes, I am drooling. That chicken curry looks so good. Perfectly paired with the raitha! This looks sooo good, I wish my boyfriend liked Indian food. I might have to save this for when I am alone or a ladies night. 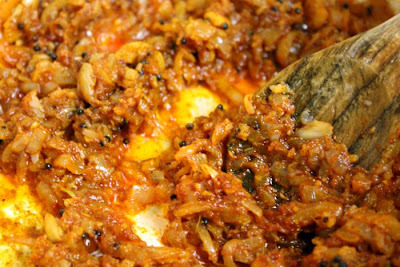 I want this with rice or naan tonight!!! Chicken and sour cream...where do i sign? Sounds so good. 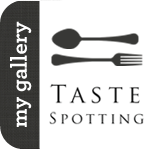 So I came here via tastespotting.YUM! 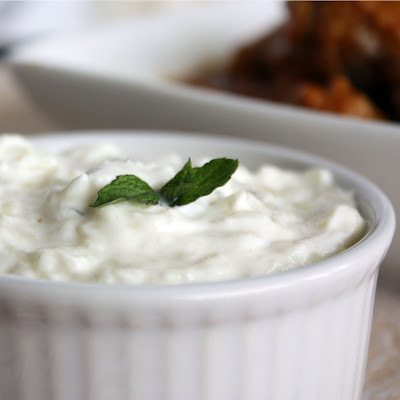 I love the sour cream raita that u ve made. 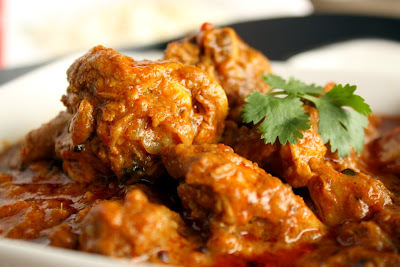 I enjoy using sour cream in lots of Indian curries. Yum! chicken is absolutely divine, loved your way of adding shredded cucumber to raita. wow! this sounds great! delicious flavors! This looks great; I love curry. Thanks for sharing the recipe. Your sour cream raita is simply delicious, can't wait to try it! Thanks for posting this intriguing recipe! You're absolutely right. Sour cream paired with the chicken and with the curry, and all the other great spices are "finger lickin' good"...richer than with the yogurt! 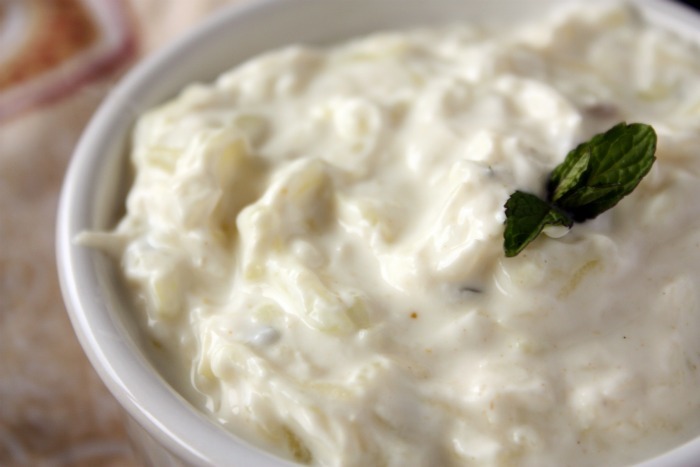 The raita is awesome, as well!